Editor's note: This story contains descriptions of a traumatic injury. Sylvia Ennis never saw it coming. There was no towering shadow, no groan of splintering wood — nothing to telegraph the fact that a 100-foot-tall pine tree was about to slam onto the roof of her Toyota Corolla. Nothing to signal that her world was about to change. To talk about it now, nearly three years later, Ennis is matter-of-fact, ever the business administrator. She does not flinch at the details, which she remembers with a near-photographic clarity. It was the morning of Jan. 2, 2013 — shortly before 9 a.m. — and Ennis was winding along Clifton Road just east of campus, a familiar route that she followed nearly every day to her job at Emory. Normally, she didn't work that day. Typically, she would have been arriving later. But she had agreed to meet a new employee at the Neonatology Division of the Department of Pediatrics at Emory School of Medicine, where Ennis served as the clinical business manager. Driving to campus, her thoughts spooled around the work of the day and the excitement of an upcoming trip — a Caribbean cruise with friends to celebrate her 50th birthday in early February. She never heard the tree coming down, only the sudden explosion of crushed steel and shattered glass. Bewildered, Ennis struggled to comprehend what had just happened. Glancing down, she saw a tree limb as big around as a human arm protruding from her torso. The branch had speared through the windshield and threaded through her steering wheel, plunging deeply into her lower left abdomen. Later, she would learn the branch had actually passed through her, exiting her right buttock, where it slid through the fold in the driver's seat, coming to rest against the floorboard of the backseat. But in that moment, shivering and in shock, Ennis recognized that she was conscious. She was breathing. Ennis' thoughts spun to her son, Dayvon, and grandson, Nasir. Closing her eyes, she prayed they would find peace without her. Through the dense tangle of pine needles and branches, a man's face appeared at her window. "Are you okay? Can I call somebody?" the stranger asked. Through her shock, Ennis somehow recited the number for her sister, Janet. At DeKalb County Fire Rescue (DCFR) Station One, located across from Emory Point on Clifton Road, the call came in at 8:47 a.m. Tree down. Vehicle struck. Possible entrapment. Within minutes, the crew on Engine 1 arrived to discover a massive, old-growth pine splayed across the road. "Basically, the tree had swallowed the car," recalls Matthew Robison, a firefighter and paramedic who was among the first at the scene. To complicate matters, it had also toppled a power pole, leaving a power line snaking across the back of the sedan. As luck would have it, two employees from Georgia Power heard the call, and rushed to the scene. They confirmed the line was dead — "a real turning point that made extrication possible," says DCFR Capt. Jeff Goins, who was on a call with the station's hazardous materials team only blocks away. When rescue workers reached Ennis, they found that a 5-foot-long branch had broken through her windshield. But with no sign of blood, it appeared to be jammed against her lower abdomen, effectively pinning her. Climbing through a rear window, hazmat team member Samuel Payton Owens positioned himself behind the driver's seat, embracing Ennis to stabilize her. Once inside, he saw that the branch had actually passed through her. Using a sheet to shield her, rescue workers began sawing through the branch just inches from Ennis' face. It was delicate work. Her airbag, which had never deployed, could go off at any moment. When the saw sent vibrations through the tree limb, Ennis moaned softly — the only noise she ever made. "She was making her peace with God that day," Goins recalls. "You could see that in her face." Among the rescue crew, many had seen impalements before. Usually it was the result of an industrial accident, someone falling from a building or fleeing law enforcement. Emergency protocol typically calls for leaving those objects in place, where they can act as a stopper, often preventing more serious bleeding. 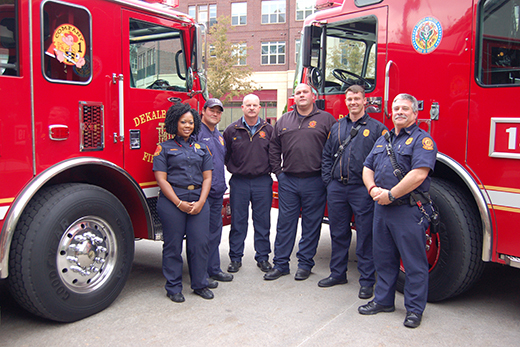 Members of the DeKalb County Fire Rescue team who responded to Sylvia Ennis' accident vividly recall their work to extricate her from her crushed car. The crew is based at Station One, located across from Emory Point on Clifton Road. When DCFS emergency medical technician Jeanine Fannell checked Ennis' vital signs, she found them surprisingly stable. Working quickly, the rescue team propped her on her right side for transport, tree limb intact. Through all of it, Ennis was awake and aware. 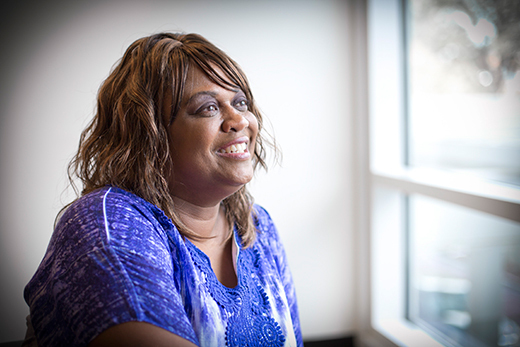 When she heard talk of Grady Memorial Hospital's Marcus Trauma Center, she knew her condition was critical. At Grady, trauma surgeon Omar Danner was making morning rounds when a page came in about a woman who'd been impaled by a tree limb. The call was so unusual, he thought it must be a trauma drill. Ennis had received an IV for fluids at the scene of the accident, but her blood pressure was now plummeting. When trauma center nurses tried to draw blood, there was nothing — a sign of near-total circulatory collapse. Attaching a unit of blood to the existing IV, they sped Ennis to the operating room. The damage was extensive, Danner recalls. There were injuries to her bladder, ureter, colon, small intestine, her stomach muscles and soft tissues, and her right buttock. Her pelvis was fractured. But despite the deep, dirty wound — they would spend weeks flushing splinters and debris from it — the tree limb had somehow spared Ennis' major blood vessels. For more than three weeks, Ennis was kept in a medically induced coma. Waking, she struggled to grasp the full scope of her medical care. There had been multiple surgeries, and there would be many more — she lost count after 15. But Ennis also became aware of another kind of care going on around her. Word of her accident spread quickly at Emory, leaving friends, co-workers and colleagues in stunned disbelief. Then they sprang into action, ferrying food and basic toiletries to Ennis' family members in the hospital waiting room, placing her name into church prayer chains, knitting a "hug blanket", and establishing a fund for donations to help with ever-growing medical bills. "We knew it was almost unheard of to recover from an injury like that," says David Carlton, division director for the Division of Neonatology in Emory School of Medicine's Department of Pediatrics, who still keeps in touch with Ennis. "But Sylvia is a person who has this intangible quality that I call 'sparkle' — she's a very engaging individual who wants to do things the right way. When she's in, she's all in. Maybe that's a quality that allows you to prevail." In time, a steady stream of co-workers was visiting her hospital room. Cards of support arrived by the dozens from people she had known while serving on Emory's Employee Council, co-workers — even the children of colleagues. While Ennis was in rehab, a co-worker decorated her room in butterflies. Others pooled funds to purchase a specialized walker. Doctors she knew at Emory stopped to chat when work took them to Grady. To Ennis, the outpouring was both welcome and deeply moving. Though she hasn't been able to return to Emory, those ties — and support — have remained strong for nearly three years now. In fact, Ennis credits it with her ongoing healing. When medical appointments bring her to campus, former co-workers still make a point to stop by and greet her, take her to lunch, or celebrate a birthday. That doesn't surprise Liz McCarty, clinical administrator for the Department of Pediatrics at Emory School of Medicine. "Sylvia has always impressed me with her ease at connecting with people," she says. "She values relationships and people remember that." Today, Ennis is on the mend. Though she struggles with ongoing nerve damage and continues treatment with Emory physicians, she is able to walk with the assistance of a walker. Some days are good, others harder. "No matter how much pain that I still feel every day, I rejoice in that pain," she says. "I rejoice to God because I am blessed to feel pain, because it could have gone the other way, to not feel anything." Ennis has never revisited the scene of the accident. She turns off news accounts about falling trees and even had a few trees in her own yard taken down. More than anything, she's grateful for the extraordinary network of people who made her rescue and recovery possible. So many healing hands, so many people to thank. "The support I get from family, friends and co-workers has kept me going, kept me wanting to live," Ennis explains. "Even now, they're still reaching out. I only wish there was a way to repay it all." Next week, Ennis will join friends and family on her long-delayed Caribbean cruise. It's been nearly three years since her accident. It was time, she says. Time to celebrate the miracle of simply being here.